I had come back to India after 5 years of living abroad. My last country being Singapore. My husband was hired by a firm in Delhi and it gave me the jitters to know I was going to be in the city I had always avoided. I was fit to take care of myself in a situation that probably was life and death for me! Enough said! Beyond the issues of weight-loss, lifestyle diseases, toning up and looking good, Fitness plays a role in a women’s life for safety too…And you will never realize it till you are struggling to survive that moment! But if more than 70 % women in our country are still fighting the increasing incidence of breast cancer, diabetes, blood pressure and coronary diseases, the idea of staying fit for one’s own safety goes down the priority list! So a couple of months back when Vivafit called me to experience their ‘All women’s gym, for some random reason, this entire incident came to my mind! An all women’s gym – where women leave all their inhibitions behind to get fit, where women don’t have to fight randomly staring eyes! Interestingly the gym had many women in the age group of 40+. After interacting with them for about 20 minutes before the session, it was clear that most of them had neglected their health for a long time, but now staying fit, feeling and looking good was their first priority. One lady also told me – that she regrets not working on her fitness in her 40s. She started at 50 – but is determined to get fit now! I attended 4 circuit training sessions there. 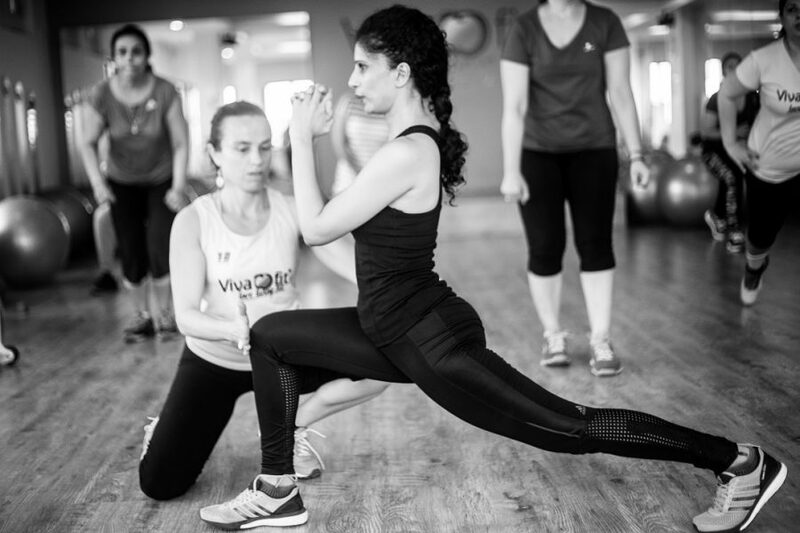 The circuit training format of Vivafit is something one has to experience to understand its differentiator value. I found it comforting how the machines were women centric – which basically means they are designed to work on a women’s body keeping in mind their frames, their difficult to lose weight points. These machines are very different from the ones you see in regular gyms. It was a grind that left me feeling more refreshed than tired. The one thing that stood out about the vivafit gym, apart from the comfortable environment it gives to women, are the hydraulic workout machines! These machines are great from resistance training without giving any injury ever and this I thought was truly fantastic about that space! I saw overweight women (chucking their inhibitions)– putting out every bit of strength in their bodies to strength train. I also saw a daughter in law and mom-in-law duo working out together! I said to myself – Wow– this space is making women come together! Hugely impressed by two of their trainers – A young ball of energy named – Ritu. And a Spanish lady who does a great job of correcting everyone’s postures during resistance training, apart from being an excellent circuit trainer. Is walking not enough to stay Fit? Both walking and dancing are great but they are pure cardio. With just cardio, your calorie burn stops when you stop exercise. Lose Body Fat – As lean muscle increases so does your resting metabolism, and you burn more calories all day long! Physically Stronger – It Can Increase A Women’s Strength By 30-50%. Fight Depression – There is no doubt that getting fit is about gaining confidence. If you still aren’t convinced about getting fit or adding the fitness angle to your life, answer these questions and you will know whether or not you need help to improve your fitness levels! The biggest question however is what is it that you want from your fitness journey? Weight loss? Strength? An active lifestyle? Self-defense? The answer to this will define your immediate plan and need! Fitness is a lifestyle and not a visit to a Gym! I am not 40 yet – but I can already feel my hormones and my body wanting a different treatment and outlook to tackle the health issues the 40s bring in every woman’s life – Sooner or later! Ratna’s Fitness Story. 44 and Fabulous! Coming Alive – Wanderlust Yogini in Udaipur – Part One! Go Fearless or Go Bust – Find the Right Sports Bra First!! !